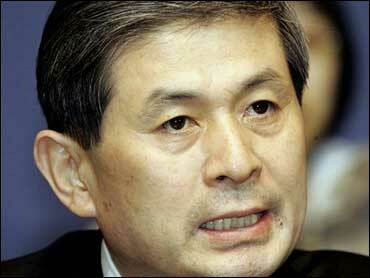 Silver Lining In Korean Stem Cell Scandal? Remember the spectacular South Korean stem cell fraud of a few years ago? A new analysis says the disgraced scientist actually did reach a long-sought scientific goal. It's just not the one he claimed. The new study suggests Hwang Woo-suk and his team produced stem cells — not through cloning as they contended — but through a different process called parthenogenesis. That, too, is an achievement scientists have long been pursuing. In 2004, when Hwang and his colleagues at Seoul National University announced they had produced a human embryo through cloning and that they had recovered stem cells from it, the news made headlines around the world. Two years later their research and a later paper were declared frauds by a committee of his university. The stem cells weren't produced by cloning, the committee said, but it was highly likely that they came about through a much different process called parthenogenesis. In parthenogenesis, an unfertilized egg is stimulated to start dividing as if it had been joined by sperm. It develops for a while under the control of its own DNA. Some species, such as sharks, can reproduce that way. Human eggs can't develop long enough to make a baby. In cloning, by contrast, an egg's DNA is removed and replaced with genetic material from a person. It is then stimulated, as in parthenogenesis, but it develops under the control of the donor's DNA. Scientists have long hoped to use parthenogenesis to produce stem cells. Like cloning, parthenogenesis could provide stem cells with a genetic match to a person — in this case, the woman donating the egg. That in turn could be useful in studying the basic biology of diseases and perhaps in creating tissues for transplant treatments. The first scientific paper to report stable populations of human stem cells obtained through parthenogenesis appeared only about a month ago. In a paper published online Thursday in the journal Cell Stem Cell, an international team of scientists says Hwang and his colleagues actually accomplished the feat in the research behind their discredited 2004 paper. New genetic analysis of Hwang's stem cells establishes that conclusion with "as close to certainty as you can come in biology," said an author of the new analysis, Dr. George Daley of Children's Hospital Boston and the Harvard Stem Cell Institute. He and colleagues started by analyzing mouse stem cells generated by cloning or by parthenogenesis. They found that parthenogenesis leaves a distinctive signature in the DNA. That same signature appeared in DNA from Hwang's stem cells, they reported. Kent Vrana of Pennsylvania State University, who studies the use of parthenogenesis to produce stem cells, agreed that the new paper establishes that Hwang's line came from that process. "While there has been some controversy about that in the field, this paper, I think, resolves that question," said Vrana, who had no role in Daley's research. Hwang, who was fired from the Seoul university in 2006 and now heads a privately funded lab outside of town, has turned down recent interview requests. In his 2004 paper, he and his co-authors addressed the possibility of parthenogenesis. They wrote that they couldn't completely rule it out, but they presented evidence to support their claim of cloning. So what happened? Were they fooled? Or were they lying? Vrana said he doesn't know. It's possible, he said, that the Korean researchers didn't realize what they'd done because they handled a lot of eggs in a technically tricky experiment. Daley, who visited Hwang's university lab before the scandal broke, said: "We just don't know, and this is one of the curious and provocative questions that may go unanswered in the history of this debacle."